It's reckless to be checkless. 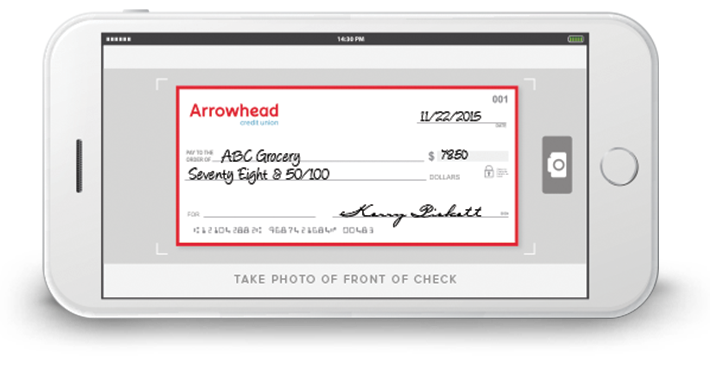 Access your money how you like, and when you like, with checking solutions from Arrowhead. Are you or someone you know one of our Hometown Heroes? Arrowhead has an exclusive program to honor those who work hard to protect our community. And, if you're new to Arrowhead you’ll need to be eligible for membership plus provide a badge or identification card when you join. *Hometown Hero Equipment Loan requires badge or military ID and direct deposit into a Hometown Hero checking account. 12-month term with a rate of 10.99% APR*. Rates and terms are subject to change at anytime. Estimated monthly payment of $88.79 per $1,000 borrowed. Maximum loan of $1,000. No credit qualifying. Must provide badge or military ID to qualify for Hometown Heroes membership. How do I open a Hometown Hero checking account? If you’re new to Arrowhead, make sure you’re eligible for membership then bring your badge or identification card to the nearest Arrowhead branch location. Current Arrowhead members, stop by your favorite branch with your badge or identification card and we’ll get you started. Your checking account routing number is 322282603. You will receive your Visa debit card instantly in a branch or by mail in 7-10 business days. When will I get my checks? You will receive personalized temporary checks when your account is opened in a branch. If requested, your Hometown Hero checks will arrive by mail within 7-10 business days. Call the Call Center at (800) 743-7228 or order online. You can access your account using our mobile app or through online banking. Visit the App Store or Google Play to get the app. You can transfer money, pay bills, set-up alerts, and check your balances.